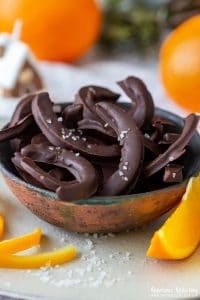 Looking for fun Halloween food ideas? 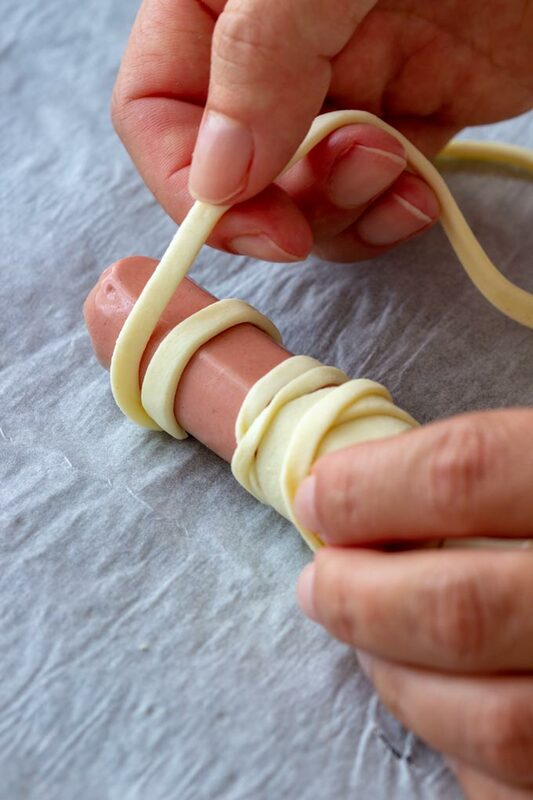 Why not giving these hot dog mummies a go? 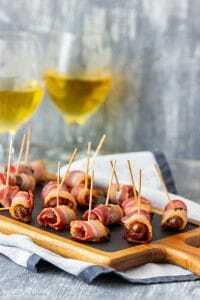 An easy finger food recipe that anyone can do! 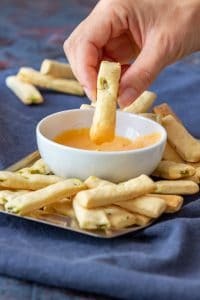 Also perfect for those looking for last minute Halloween finger foods ideas! 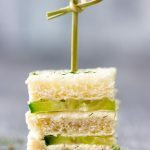 Great baking project for kids – it’s a quick recipe so they will not get bored easily (another easy project is making dessert shooters for Halloween). 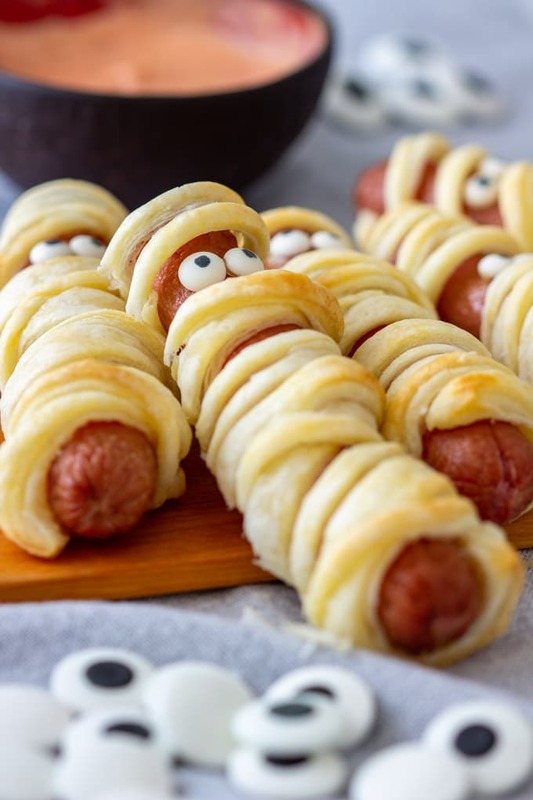 Easy preparation – making these Halloween hot dog mummies is easy and simple. There is no need for any special techniques. Fun idea – kids as well as adults love these. No special tools/gadgets needed – use what you have. 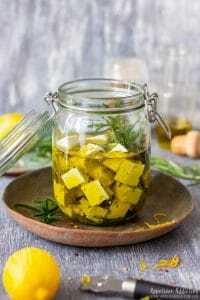 3 ingredients – is all it takes to make them! 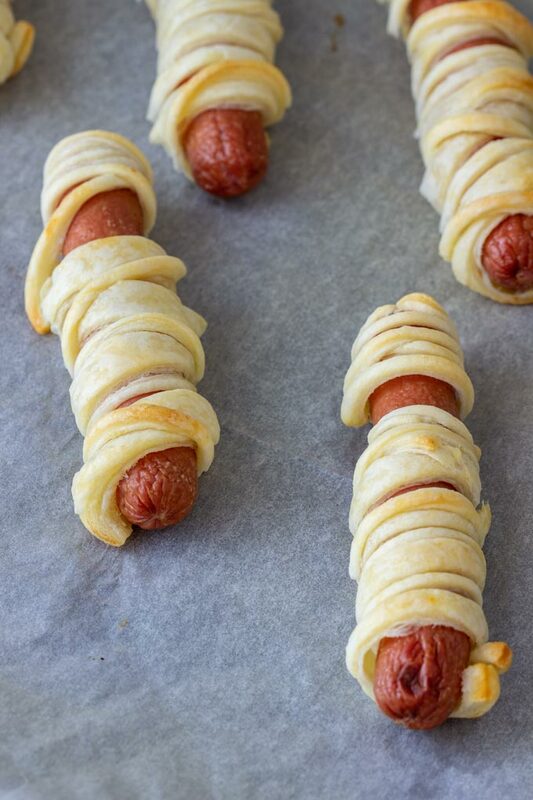 Plus these puff pastry hot dog mummies are ready in no time. 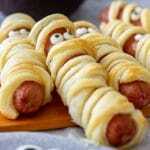 Now I am using puff pastry to make these hot dog mummies. It is a delicious and where I live also an inexpensive way to make them. The whole process is easy and pretty quick. 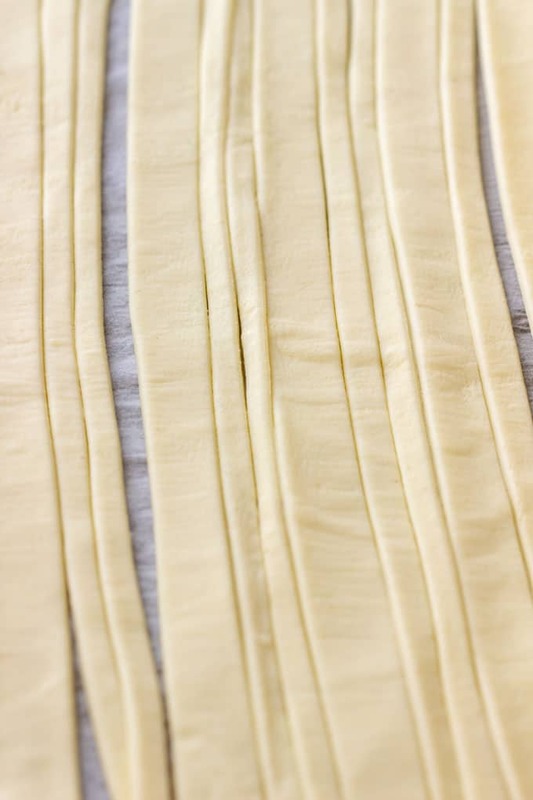 All you have to do is unroll/unfold the ready-rolled puff pastry and cut it into thin strips. Depending on the size of the hot dogs and the length of the pastry you might need more or less strips than I used. I counted with 3 strips per hot dog. One thicker and two thin ones. Use the thicker strip first. Just wrap it around the hot dog. It does not have to be neat. Just make sure you leave a gap for the eyes. Then repeat the same process with the other two strips. When ready, place them onto a baking tray that is lined with baking parchment paper. Cook them in a preheated oven until the puff pastry is puffed and slightly brown. 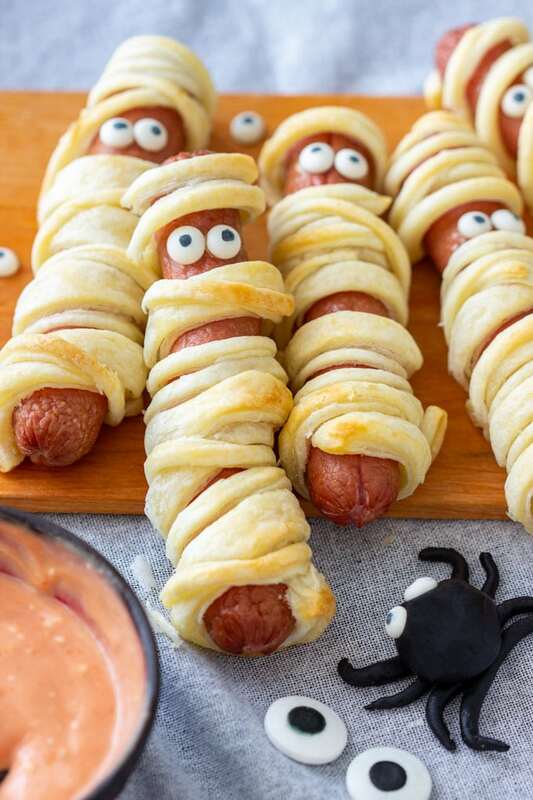 What to serve hot dog mummies with? 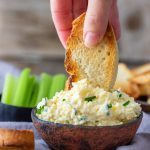 They go so well with a dip of your choice: Honey mustard, garlic or mayo dip. 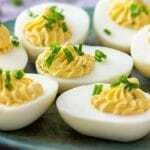 You can also serve them with plain or spicy ketchup or any kind of sauce you like. I used a mix of mayonnaise, ketchup and pressed garlic. 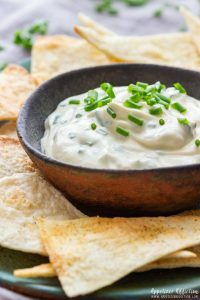 It’s our favorite dip/sauce for hot dogs, burgers or barbecued meats. Pizza cutter is the best tool to use for cutting the pastry. It makes the cutting so easy and quick. Now if you don’t have one, don’t worry. Use a knife instead! The baking time might vary slightly. This will depend on a few factors: the oven, the amount of puff pastry layers you have on each hot dog as well as the puff pastry itself. I usually bake them for 12-15 minutes. Now also bear in mind that the pastry is not brushed with egg wash before baking. This means that its color will turn pale – very light brown. I don’t recommend leaving the hot dogs in the oven until they look browner than that. This will just cause them to dry out. I used tiny edible sugar eyes. If you don’t have these or can’t/don’t want to buy them, you can pipe tiny eyes using mustard instead. 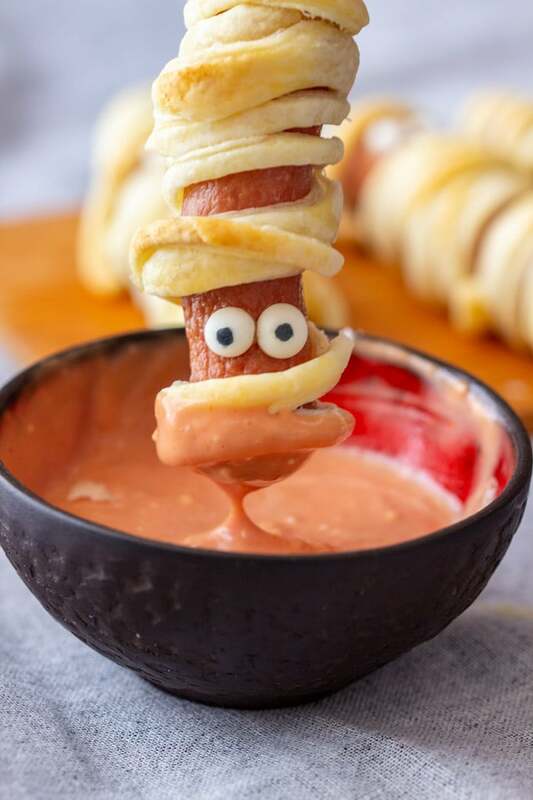 Hot Dog Mummies are an easy Halloween appetizer that anyone can do! Also kid-friendly. Unfold/unroll the puff pastry. 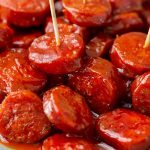 Cut it into strips (1 thicker + 2 thinner per hot dog). Pat dry each hot dog with a paper kitchen towel. 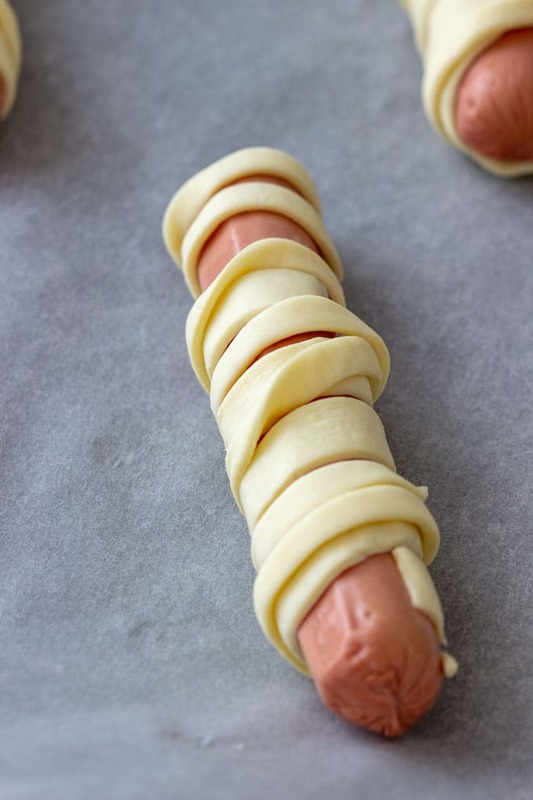 Wrap the thicker puff pastry piece around the hot dog, making sure to leave a gap for the eyes. Repeat the same with the thin strips. When done, place them onto a baking tray lined with baking paper. Bake them in a preheated oven at 360⁰F/180⁰C for 12-15 minutes or until the pastry is puffed and light brown. Let them cool slightly before putting the eyes on. To do this, just put a little mayo/ketchup/mustard on the back side of the eye and stick to the hot dog. Serve on their own or with a dip of your choice. Use any hot dog brand you like as long as they are small in size (About 4-inch/11cm or smaller). If you can’t buy the edible eyes, you can pipe 2 dots using mustard. The large sugar eyes are not a good option for this. The baking time may vary slightly - depending on the thickness of the puff pastry and also how accurate your oven is. When the pastry is puffed and its surface is lightly brown, they are ready to be taken out. Thank you! 🙂 It is very easy indeed. Omgosh I can hardly take the cuteness of these! I am in love with Halloween themed food and I’m adding this one to the list. Thanks for sharing…pinned! How cute are these hot dogs? I love this idea. Definitely stealing it. My boys will love them! 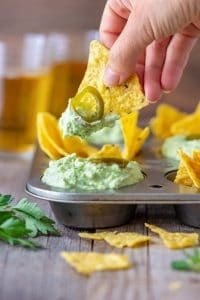 Super Adorable and easy to make. Everyone will love them at my Halloween party. Thank you for sharing. Olives are a great alternative!